Netflix Windows Store application may experience display flicker during video playback on some HDR enabled displays. World of Warcraft patch 8.1.5 or later may experience an intermittent crash or application hang when MSAA is enabled. Vari-Bright changes may fail to apply on some AMD Ryzen Mobile Processors with Radeon Vega Graphics system configurations. World of Tanks may experience intermittent graphical corruption when game settings are set to minimum on Radeon RX Vega series graphics products. Rainbow Six Siege may experience intermittent corruption or flickering on some game textures during gameplay. DOTA 2 VR may experience stutter on some HMD devices when using the Vulkan API. AMD is thrilled to help expand DirectX 12 adoption across a broader range of Windows operating systems with Radeon Software Adrenalin 2019 Edition 18.12.2 and onward, which enables consumers to experience exceptional levels of detail and performance in their games. ACER KG251Q display may experience a black screen when connected via DisplayPort and enabled at 240hz. Video playback may become green or experience corruption when dragging the Movies and TV application to an HDR enabled display. Modifying memory clocks on Radeon VII in Radeon Wattman may intermittently result in memory clocks becoming locked at 800Mhz. Some Mobile or Hybrid Graphics system configurations may intermittently experience green flicker when moving the mouse over YouTube videos in Chrome web browser. AMD Radeon VII may intermittently experience a system hang when attempting to perform a timeout detection and recovery on Windows 7 system configurations. Player Unknown's Battlegrounds may intermittently experience an application crash when changing post-processing settings. Battlefield V players may experience character outlines stuck on screen after being revived when the game is set to using DirectX 12 API. FRTC may disappear from the Radeon Settings Global Graphics options on some system configurations when upgrading Radeon Software. Radeon WattMan clock gauges may sometimes not change or appear incorrect when custom settings have been set on AMD Radeon VII. Fan speeds may remain elevated for longer periods than expected when using Tuning Control Auto Overclock in Radeon WattMan on AMD Radeon VII. A workaround is switching fan control to manual mode. Assassin's Creed : Odyssey: Up to 5% performance improvement with AMD Radeon Software Adrenalin 2019 Edition 19.2.1 on a Radeon RX Vega 64. Anthem may experience a white screen or corruption while playing or launching the game. Rocket League may experience flickering or erratic refresh rates when Radeon FreeSync is enabled. Radeon Overlay's new in overlay video player may experience smoothness issues while adjusting the playback slider. Memory clocks on Radeon RX Vega series graphics products may become locked at 800Mhz. Game profiles with custom fan settings may sometimes remain even after closing a game. The game streaming tab may be missing in Radeon Settings when Radeon Software Adrenalin 2019 Edition is installed twice on a system. Radeon ReLive for VR may experience minor corruption for a few seconds immediately after connecting a headset. Auto tuning controls are not displaying their warning message in Radeon Overlay. Custom values for the sampling interval slider in the performance metrics feature may fail to enable. Radeon Settings may sometimes list a previously installed driver version even after driver successfully upgrading. Apply and Done buttons may sometimes overlap in Radeon Settings or Radeon Overlay. Zero RPM may fail to enable/disable correctly when switching between manual and automatic fan controls. Streaming enabled via Steam , the Steam VR ecosystem* and available through the Radeon ReLive VR app. Scans your system's capabilities and provides optimization suggestions in just a few simple clicks. Available through Radeon Settings. Assassin's Creed: Odyssey may experience a black screen when going into action phases of the game. Assassin's Creed: Odyssey may experience a game crash or TDR in some locations of the game like performing a leap of faith or deep-diving into water. Forza Horizon 3 may experience a game crash on launch. Call of Duty: Black Ops 4 may experience a crash on launch on AMD Ryzen desktop processors with Radeon Vega Graphics. A limited number of users may experience a black screen or signal loss when watching YouTube videos in full screen mode on Chrome browser. Battlefield 1 may experience flickering when looking at water textures. Strange Brigade may experience stuttering when the game is set to run in windowed mode using the Vulkan API. Radeon Overlay may fail to invoke when playing Kingdom Come Deliverance. This release is not compatible with Microsoft PIX. For Microsoft PIX support with Radeon Software Adrenalin 2019 Edition please click here. Assassin's Creed : Odyssey may experience a game crash at certain locations of the game on Windows 7 enabled system configurations. Radeon Software update notifications may sometimes incorrectly list the currently installed driver as an available software update. This extension allows controlling whether explicit overallocation beyond the device memory heap sizes is allowed or not. Assassin's Creed : Origins may experience an application crash while launching or playing the game in Windows 7. Some Vulkan API games may experience a crash on game launch. On multi GPU enabled system configurations Assassin's Creed Odyssey may experience a random game exit when Adaptive Anti-Aliasing is enabled and the game is restarted. Strange Brigade may experience an application hang when playing with DirectX 12 API enabled. HDMI Audio Drivers may sometimes not upgrade during Radeon Software installation. Fortnite may experience lighting corruption when effects quality is set to High or Epic. Sea of Thieves may experience flickering textures in multi GPU system configurations. Microsoft Office applications may experience lag or stutter when dragging applications. This extension advertises the SPIR-V Int64Atomics capability for Vulkan, which allows a shader to contain 64-bit atomic operations on signed and unsigned integers. This extension provides a new physical device query which allows retrieving information about the driver implementation, allowing applications to determine which physical device corresponds to which particular vendor's driver, and which conformance test suite version the driver implementation is compliant with. This extension provides two new instructions to decorate a variable or a struct member with a string. This extension provides two new decorations to extend HLSL functionality: HlslCounterBuffer and HlslSemantic. Some AMD Ryzen Desktop Processors with Radeon Vega Graphics system configurations may experience a black screen during installation downgrade to a previous Radeon Software version. A recommended workaround is to perform a clean install during Radeon Software installation. Radeon FreeSync may fail to enable when playing Monster Hunter : World. Radeon Settings may sometimes not appear in the right-click context menu on Windows desktop after Radeon Software installation. Some DirectX 12 gaming applications may experience instability while recording with Radeon ReLive on system configurations using Radeon R9 290 and Radeon R9 390 series graphics products. Radeon FreeSync may fail to enable when playing Call of Duty : Black Ops 4. Some DirectX 12 gaming applications may experience instability while recording with Radeon ReLive on system configurations using Radeon R9 290 and Radeon R9 390 series graphics products." Strange Brigade may experience fps drops on multi GPU enabled system configurations when Enhanced Sync is enabled and Vulkan API is enabled. Flickering may be observed on some displays when Radeon FreeSync is enabled with Radeon ReLive enabled and recording. Fortnite may experience an application crash on game launch in Windows 7. Civilization VI may experience a game crash using DirectX 12 API on game or map launch. Samsung HMD Odyssey may experience intermittent black screens or flashing on Radeon RX Vega series graphics products. Up to 28% faster performance using Radeon Software Adrenalin Edition 18.7.1 on the Radeon RX Vega 56 (8GB) graphics card than with Radeon Software Adrenalin Edition 18.6.1 at 2560x1440 (1440p). Up to 22% faster performance using Radeon Software Adrenalin Edition 18.7.1 on the Radeon RX 580 (8GB) graphics card than with Radeon Software Adrenalin Edition 18.6.1 at 2560x1440 (1440p). Up to 27% faster performance using Radeon Software Adrenalin Edition 18.7.1 on the Radeon RX 560 (4GB) graphics card than with Radeon Software Adrenalin Edition 18.6.1 at 1920x1080 (1080p). Fortnite Season 5 may experience an application hang on some Radeon graphics products when throwing stars are visible on screen. Hellblade: Senua's Sacrifice may experience flickering or corruption on some Radeon graphics products. Display modes may sometimes appear as not available when setting resolution or refresh rates of a display. CorelDraw may experience slower than expected performance. Memory clocks may remain at higher than expected values on some displays after changing resolution or refresh rates. Some displays may exhibit black screen flickering when booting to desktop when using DisplayPort. Virtual Super Resolution settings may not retain after updating to this Radeon Software release. Wolfenstein II: The New Colossus may experience an application crash when disabling Asynchronous Compute via game settings. Graphics and memory clocks may remain at higher than expected values after watching a video or using Windows DVR while in game. A workaround is to reboot the system. Radeon WattMan gauges may report as zero on secondary graphics products in multi GPU enabled system configurations. Up to 9% faster performance using Radeon Software Adrenalin Edition 18.6.1 on the Radeon RX Vega 56 (8GB) graphics card than with Radeon Software Adrenalin Edition 18.5.2 at 2560x1440 (1440p). Up to 10% faster performance using Radeon Software Adrenalin Edition 18.6.1 on the Radeon RX 580 (8GB) graphics card than with Radeon Software Adrenalin Edition 18.5.2 at 2560x1440 (1440p). Subnautica may experience a black screen on launch or during gameplay. Sea of Thieves may experience a crash or hang while playing in the Cannon Cove area. Desktop may not be visible or may appear out of the display area when using 8K resolution on Radeon Pro Duo. World of Tanks may experience square corruption on some ground textures in multi GPU system configurations. Middle Earth: Shadow of War may experience flickering in some game menus or when configuring displays when using multi GPU system configurations. World of Warcraft may experience flickering on the mini map in multi GPU system configurations. Sea of Thieves may experience an application crash or hang after the initial splash screen. Brightness or white screen issues may be observed when playing The Crew on daytime maps. Shader Cache may sometimes fail to enable or may not correctly cache shaders for games. A limited number of Radeon FreeSync enabled displays may experience a blank screen when Radeon FreeSync is enabled in a game. Warhammer : Vermintide 2 may experience an application hang upon changing resolution. Some zombie textures may fail to render in horde mode for Arizona Sunshine . The Witcher 3: Wild Hunt may experience stuttering during gameplay. Edited videos sometimes fail to appear in the Radeon ReLive gallery after switching tabs. Corruption may be experienced with OGL or Vulkan API applications on some Hybrid Graphics system configurations. Destiny 2 may experience increasing load time durations when the game is run for extended periods of time. Netflix playback through a web browser may experience corruption or hangs when using multi GPU enabled system configurations with Radeon RX 400 series or Radeon RX 500 series graphics products. Radeon ReLive streaming or uploading of videos to Facebook may intermittently fail. Water textures may not render or may appear to be missing in World of Final Fantasy . Stellaris may experience an application hang on loading screens. Call of Duty : World War II may experience corruption during gameplay on some Radeon RX 400 series graphics products. Sea of Thieves may experience flickering in some game menus on multi GPU enabled system configurations. Rise of the Tomb Raider may experience an application hang when launched using DirectX 12 API. World of Tanks may experience minor corruption on ground textures. Some DirectX 9 games or applications may experience a hang or system instability when being run on multi GPU system configurations utilizing four GPUs. Some blockchain workloads may experience lower performance than expected when compared to previous Radeon Software releases. Final Fantasy XV may experience bright lighting effects on some trees in specific map locations. Final Fantasy XV may experience an application hang or crash after advancing in game to chapter 2. Far Cry 5 may experience flickering issues if a task switch is performed while playing the game using a multi GPU enabled system configuration. Destiny 2 may experience an application hang in the mission "Heist" on some Radeon GCN1.0 products. Destiny 2 may experience long load times when the application has been open for extended periods of time. Product is conformant with the Vulkan 1.1 Specification. Vulkan and the Vulkan logo are registered trademarks of the Khronos Group Inc.
Forza Motorsport 7 may experience intermittent stutter during gameplay. Some Radeon ReLive recorded clips may experience corruption or audio distortion when played back. Final Fantasy XV may experience flickering or disappearing objects during some gameplay in multi GPU enabled system configurations. Star Wars Battlefront 2 may experience a system hang on the initial splash screen in multi GPU enabled system configurations. Final Fantasy XV may experience minor stutter during some particle effects. Sea of Thieves may experience an intermittent application hang or crash during gameplay. Middle-earth: Shadow of War may experience texture flickering on trees or hills when using multi GPU enabled system configurations. World of Tanks may experience color corruption when changing some game settings in multi GPU enabled system configurations. Destiny 2 may experience long load times when the application has been open for long periods of time. Final Fantasy XV may experience minor stutter during some particle effects. A workaround is to disable the "Geomapping" setting in game. Radeon Overlay may exhibit minor flickering when enabled while playing games using the Vulkan API. Fortnite may experience lighting or fog corruption on some graphics quality presets. Middle-earth: Shadow of War may experience an application crash when launched as a Universal Windows Application. For Honor may experience an intermittent application crash on launch. Water textures may appear to be missing in World of Final Fantasy. Flickering may be observed on the performance metrics overlay when Enhanced Sync is enabled on some Radeon FreeSync connected 'displays. Sid Meier's Civilization V may fail to launch on Hybrid Graphics system configurations when using DirectX9 API. Radeon FreeSync may exhibit a black screen on some games when using Samsung CF791 displays. Radeon Chill game settings profiles may fail to enable on Vulkan API games. Radeon Overlay may fail to open in some Vulkan API games. Need for Speed Payback may exhibit corruption on some terrain. Textures in Hyperdimension Neptunia Re;Birth3 V Generation may appear corrupted or exhibit flickering colours. A small number of DirectX 9 games may experience crashes or instability. Starcraft 2 may experience corruption in multi GPU enabled system configurations. Enhanced Sync may not enable for game profiles in Radeon Settings when using Vulkan API. On multi GPU enabled system configurations Player Unknowns Battlegrounds may experience menu item flickering. Radeon Chill may fail to enable on Vulkan API games. AMD XConnect Technology enabled system configurations may experience an intermittent system hang on hot plug. Ark Survival Evolved may experience heavy flickering or corruption when enabling the performance metrics overlay in Windows7. Star Wars: Battlefront II may experience graphical corruption in some areas of the game. Rise of the Tomb Raider may experience an intermittent application hang during gameplay. A random system hang may be experienced after extended periods of use on system configurations using 12 GPUs for compute workloads. Added new Connect tab which houses new social engagement features. Added new Gallery tab for Radeon ReLive recording file management, video trimming, and social platform sharing functionality. Added new Resource Center tab highlighting informative guides and instructions for Radeon Software features. Added new Performance Monitoring tab. 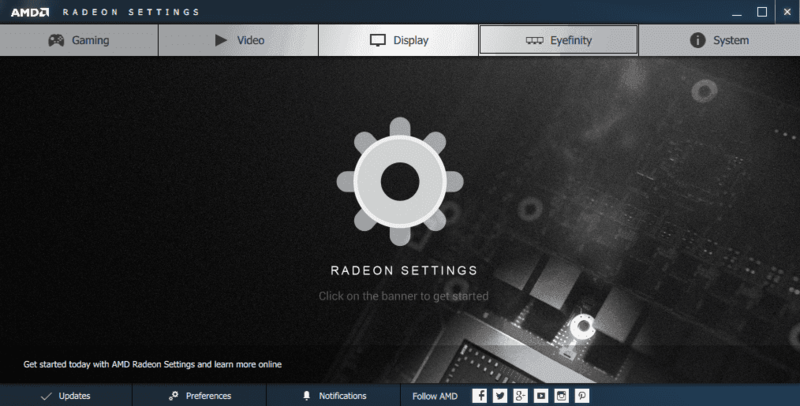 Added three UI themes for Radeon Settings customization. Added new AMD Link tab to connect Radeon Settings to the AMD Link mobile application. For more information on AMD Link visit here. Added new Overlay feature (default ALT+R) allowing management of certain Radeon Settings features while in-game or on desktop such as Radeon ReLive, Radeon FreeSync, Radeon Chill, Frame Rate Target Control, Display Color, and Performance Monitoring. Added performance monitoring overlay to display system performance metrics in DirectX 9, 11, 12, and Vulkan applications. Added performance logging feature to save performance metrics to a file. Added support for Vulkan API. Added support for borderless window region capture. Added support for mouse button hotkeys. Added chat and viewer count overlay for Radeon ReLive live streaming to supported platforms. Added Chroma Key support to allow background transparency when using a webcam. Now supports expanded social platforms. Now supports separate microphone and audio track recording. Radeon Chill now has expanded support for most game titles. Added support for all GCN-based Radeon graphics products. Added support for Eyefinity configurations. Added new profile functionality to save and load user defined Radeon WattMan profile configurations to local hard disk. Added support for HDR10 titles with Radeon FreeSync2 displays. Added per-application Radeon FreeSync support. OverWatch may experience a random or intermittent hang on some system configurations. Tom Clancy's Rainbow Six Siege may experience an application hang when breaching walls with grenades or explosives. Assassin's Creed: Origins may experience bright or saturated lighting in cave missions. Mass Effect Andromeda may have issues enabling HDR10 on an HDR capable display. Forza Horizon 3 may experience corruption on rocks or foliage during gameplay. Halo Wars 2 may experience a crash on game launch.